The biggest piece of advice Frances McGarry gave students over the course of her 30-year teaching career — take risks and don’t be afraid of failure — was crystalized in one young man who overcame his fears and found his voice. McGarry said an eighth-grade student she once had was terrified of a public speaking assignment because of a speech impediment. His mother asked that he not participate, but McGarry refused. She worked with him to overcome his barriers. McGarry, who taught English and theater in the Northport-East Northport Union Free School District until 2004, said she was fortunate to come across many students with whom she could share her passion of literature and the arts. Often, the roles between McGarry and her students reversed. “The honors English classes’ literary discussions kept me on my feet and taught me to listen and guide their queries and observations,” McGarry said. She said it’s been rewarding to see her impact on those she taught. One former student went on to become a famous actress of stage and screen. In a 2013 Broadway.com interview, she said McGarry was the teacher who inspired her to pursue acting. High praise for the teacher, but to McGarry, she was still Edie Falco, the shy teenager who graduated from Northport High School. McGarry said she maintains a relationship with the former “Sopranos” star to this day and attends many of her performances. “She’s just ‘Edie’ to me,” McGarry said. Other students have reached out to her over the years, submitting testimonials on her blog about how the arts — and McGarry — have transformed their lives. Considering her continued involvement in theater and the lasting connections she has maintained with her students, it’s no wonder McGarry said she doesn’t miss teaching. Editor’s note: This story is part of an ongoing series on the careers of retired Long Island teachers and where they are now. If you are a retired Long Island teacher and would like to share your story, click on the Newsday link. As we celebrate our bravest of soldiers who gave their ultimate sacrifice to protect our freedom, I would like you to take some time to reflect on what it means to be An American. Amid the bitterness and rancor of the 2016 Elections. . .
How haveThe Arts ( Dance, Theatre, Music, Photography, Graphic Arts) prompt a change in your life? How did it change and/or alter your perspective about a viewpoint? I am the oldest of four children and the only girl. Music has always inspired me to create great stories and complex characters that can outshine during crisis for what makes a man is what he does when the storm comes. I had a rough childhood and music was always my shelter. One day, my parents came home from a trip to Toronto where they saw Andrew Lloyd Webber’s newest musical “The Phantom of The Opera” and brought me the soundtrack tape and vinyl disc as well as the Playbill of the time; it was 1987. When I first read the story I immediately identified with “The Phantom” a man suffering the cruelty of the world due to a mother’s rejection and was hiding underneath the Opera House where “the monster” grew up to become The Angel of Music. My heart stopped. My soul was frozen as I was listening to the music and reading the lyrics. How can it be that so much grief could turn into something so magical and fascinating?! That’s when I decided I wanted to become a writer and tell stories that would ease aching hearts such as mine. So every time my mother punished me, locked me in my room and hit me yet again, I would listen over and over again to “The Phantom Of The Opera” to “Music Of The Night” and I would smile between tears. I just had to find the way to become that beautiful swan just like “The Phantom” did and turn all my pain into beauty. I was eight-years-old and fell in love with art. Years went by and I was never picked for my school’s musicals or plays. My mother was still in rage by my existence and by this time I was a teenager crying alongside my piano, which I learned quickly to play. I was sent to a boarding school in England for a year where I saw for the first time my beloved disfigured genius “The Phantom Of The Opera” in London!!!!! When I first saw the man behind the mask I found myself crying tears down to my neck as I understood he was but a vulnerable man crying for help, hiding behind a mask of strength, just like me. That was me on stage before the world to see, a wound opened hearted yearning for love exploiting in majestic music! I had to find my mask. I had to find my strength. I had to find my angel and I did… The Beatles! And I thought to myself – I will make it through- And I did! When I incorporated the story of my life into a soap opera I was writing at the time, the ratings flew over the roof and I was receiving tweets from fans all over the world telling me how my story was changing their lives and now they were doing amazing things they never thought they could do. I was thriving with joy and suddenly all the grief I had gone through was unexpectedly worth it for it has made me who I am. I wanted to push myself to the limit and I started writing a musical and created a non- profit organization where I teach orphan children to speak English through Beatles and Broadway songs to lead them to a world of new opportunities to build a prosperous future. These children are now dreaming of being someone great, of becoming a leader of achieving the unachievable! They laugh, they sing, they thirst for knowledge and they have become brothers. Thank God I went through that depression because these boys’ lives are changing with art and music! They want to be actors, singers, and football players and by God they will. I am teaching them to sing because we will form a children’s choir that will perform in schools and small theaters singing in English aiming for one dream: College. Every earnings will be funded to their college education. This is what it feels like to be alive!!!!!! And I would go through it all again a thousand times to find art in my way and do magic with it drawing smiles and planting dreams in lost little souls. And now, in six months I am moving to New York City to bet on myself I can do it! I will take musical theatre writing and I will become the best writer there ever was. I will produce my musical in Mexico and I will continue to deliver happiness to children through art for as long as I live. Art has always brought up the best in me, has always led me to hope, to regain strength and fight till the end. Art has given me happiness I wish everybody out there could experience, it has given me peace and a higher understanding of life. It has made me the artist I am and the artist I will become. In my world, art has made me My Own Angel Of Music. How are the arts re-igniting your community and sparking innovation and creativity in your local schools? I created an art photograph contests in several universities in Mexico: Ibero, Anáhuac and Tec de Monterrey, where students had to capture the different paths one can choose when crisis strikes: “BLACK” turning yourself into drugs, alcohol, prostitution, lust and hated with it’s consequences and “WHITE” Mediation, forgiveness, therapy, strength, faith and art with it’s results. The project was sponsored by Domecq None profit organization, Kodak and Convivencia Sin Violencia. KARAOKE NIGHTS FOR HAITI: I invited people to sing songs of praise and hope every Thursday for one month in a karaoke bar called REC. We gathered four thousand US dollars, which I gave to the Haiti Ambassador in Mexico City. ORPHAN CHILDREN: We teach orphan children to speak English in order to ensure them a better future through the music of The Beatles and Broadway hit songs. These children now want to become actors and singers and are anxious to one travel to New York City and see all Broadway shows, but there are 2 in particular that became quickly very popular among them: “Les Misérables” and “The Phantom Of The Opera”. The children are now hoping, dreaming and finding their own voice and importance in life in a world that had closed the doors to them. Schools across Mexico City are helping sending their students to teach and sing with the children and an environment of joy and hope has been developed in the hearts of every one that take the lessons and teach them as well. When I was just a kid, like second grade, my teacher assigned me the role of Sue the Eskimo. I had to rub noses with the male lead. I tell you, to this day, I’m shy. Even though every semblance you’d see of me points otherwise, I have to admit I was so honored to have been chosen for one of the two leads. I was a handed a script with lines. I didn’t really know better but I figured it would be a good idea to memorize them. Then, came the day we had to say our lines in front of the class. I was shocked and let down that nobody else did the same; that is, learn their lines by heart. They read their lines! I was bored to tears. My teacher just about jumped out of her chair with happiness that someone cared enough to make her efforts live. I hadn’t thought twice about it. It was one of those moments that you just live. My mom was and is an art teacher. Remember the moment in class when the teacher asks everyone to hold up their drawings for the rest of the class to see? The first or second time is no big deal, but as I grew, I sometimes, and some of the other kids shrugged away from sharing their innermost. The problem was that we made mistakes and didn’t always know how to correct them. Do you know what I’m talking about? That minute, where you just want to take your paper and throw it in the trash? Well, my mom had this way of telling me: “Julie, you can always fix it.” I didn’t quite get what she meant but she helped me to see the same painting in a new light, maybe by making other lines thicker or coming up with a new drawing that integrates the old one. They say that everyone is creative. I agree. I think all of us have that light in us that wants to shine but it can sometimes be dimmed by circumstance; however, to answer your question above, Fran, how the arts are re-igniting my community, the answer is that I’ve taken my mom’s advice and applied it to my paintings — the never-give-up, it-can-be-fixed attitude. Lately, I painted three murals for our baseball team, on my own, I’d like to say, in the morning, early hours, on a Saturday, armed with a bike, paintbrush and fun music on my earphones. I just wrote the name of my city in Coca Cola styled logo and the word, baseball. Now we have over 60 players. We started with four. That’s my story. Thank you for putting the question out there. Love it. How has your life been indelibly touched by a teacher who utilized the arts for whatever reason and acknowledge how they were instrumental in breaking the mold to allow you to become who you are today? Indelibly touched by a teacher, breaking the mold. My gut response is what I wrote above, the lesson about never giving up. But actually, if you have a second, I’d love to tell you about Mr. C. It’s really quick. Basically, I was just a simple student going to school in my sophomore year of high school, when Dr. C. called me into his office to ask me where I had planned on going to university. It sounds so cliché or ridiculous, but I had never actually had to answer that question to anyone before. He gave the packet of university applications with a map that later completely changed my course of life. Thanks again, Fran! That was fun. Creator Julie Angelos is proof positive a great idea can come to fruition if you believe in it. Julie developed jbule’s blog with $99 of her own money on a whim. Friends and family were quick to come aboard. Today jbulie’s blog can boast a 40k visitor base growing steadily to 100,000 endorsed by scores of red carpet readers just like you. Eager to pay it forward, Julie contributes to meaningful causes as well as happily helping friends and family. 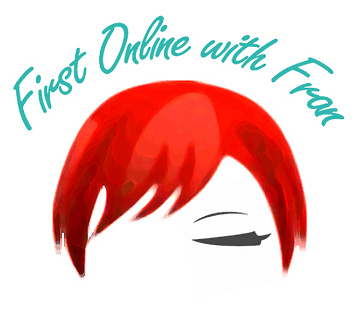 On November 19th, 2012 First Online With Fran featured Artistic Director and founder of the Cherry Lane Theatre, Angelina Fiordellisi. Listen to her reflect on the work at the Cherry Lane Theatre, most notably the 2013 Mentor Project, among others, and how they contribute to cultivating an urban artist colony, honor its ground-breaking heritage, create theater that illuminates contemporary issues and transforms the human spirit. Click here for more info.